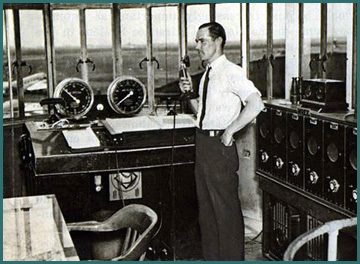 Archie W. League, usually regarded as the first air traffic controller. The 1929 photo shows him dressed for cold weather at St. Louis, where the airport operator employed him to prevent collisions between aircraft. His communication tools were simple: a red flag for "hold" and a checkered one for "go." Photo 2, League is shown on duty in his summer office. Note the rolled-up flags in the wheelbarrow, and the dangling lunch box. His other equipment included a folding chair, drinking water, and a pad for taking notes. League joined the Federal service in 1937. He eventually became FAA's Air Traffic Service director and retired as an Assistant Administrator in 1973. In December 1935, an airline consortium opened the first Airway Traffic Control Station for keeping aircraft safely separated as they moved between airports. Photo 4 shows operations at this Newark, N.J., facility during the following year. 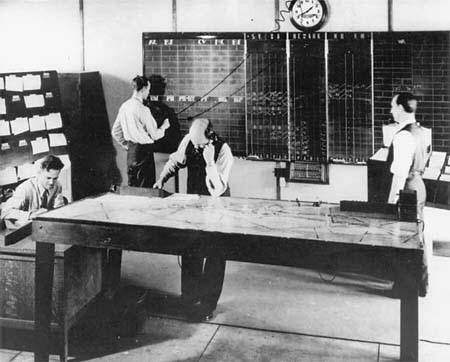 The en route controllers kept track of the position of planes moving along the airways with the help of maps and blackboards. They had no direct radio link with aircraft. 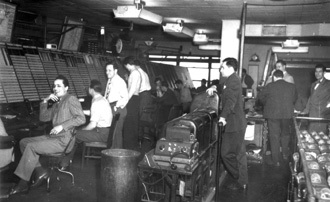 Instead, they used telephones to stay in touch with airline dispatchers, airway radio operators, and airport traffic controllers. 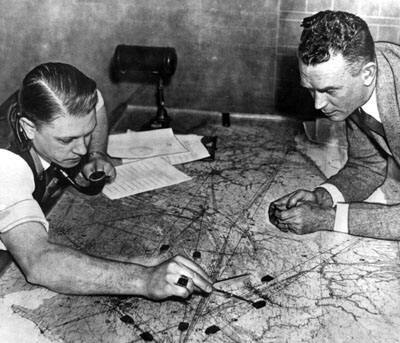 These individuals fed information to the en route controllers and also relayed their instructions to pilots. Photo 5 Earl Ward organized the Newark facility. Here, he tracks a flight with the aid of a caliper as R. A. Eccles watches. The pointed markers representing aircraft were moved across the map as flights progressed. First developed by controller J. V. Tighe, these markers came to be known as "shrimp boats." Ward soon became the first chief of airway traffic control for the Bureau of Air Commerce, whose leaders had encouraged the creation of such stations as a response to a growing danger of midair collisions. In July 1936, the Bureau fulfilled its promise to assume operation of the Newark facility and two others that had been established at Chicago and Cleveland. This began Federal air traffic control, and the three "stations" became the forerunners of today's Air Route Traffic Control Centers. 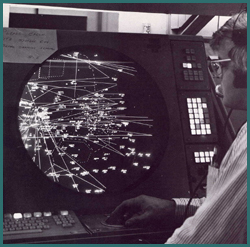 The advent of computer technology offered a way to transform the capabilities of air traffic control. Following the 1961 Project Beacon report, FAA began planning a system that would use data from both ground radar and from airborne radar beacons. 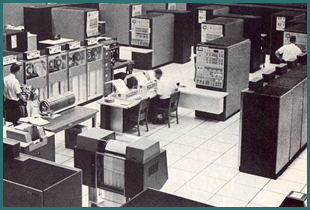 In 1967, IBM delivered a prototype computer (above) to the Jacksonville Air Route Traffic Control Center. The software written for the ensuing NAS En Route Stage A project contained more instructions than any previous computer program. 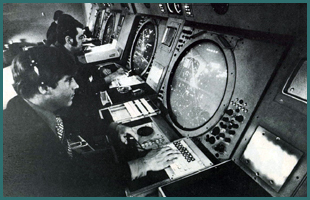 The first phase of the NAS En Route Stage A undertaking provided automatic distribution of flight-plan data through the Computer Update Equipment (CUE) shown at right. 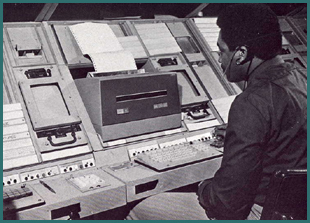 By February 1973, all the en route centers in the contiguous United States had this capability. The second and more complex phase of NAS Stage A involved radar data processing. This phase provided an aircraft's identity, altitude, and other data directly to controllers, as shown at left, through alphanumeric codes on their radar scopes. Meanwhile, FAA was also developing a system that would give similar support to controllers in airport terminal areas. The production model of this terminal area equipment, designated ARTS III, is shown at left. ARTS III was operational at 61 of the Nation's busiest airports by August 15, 1975. Eleven days later, FAA completed implementation of the second phase of NAS En Route Stage A at all its en route centers. The success of these automation programs placed the U.S. airspace system on the leading edge of technology. Many upgrades lay ahead as FAA added safety features and worked to stay abreast of expanding traffic volume. Photos 10 show, racks of paper strips replaced blackboards as a means of noting flight data in this era; however, the system still relied on indirect communications and mental calculations. Image 10 shows the Washington center during the following year. Military personnel helped operate the facility, as the uniforms indicate. Also typical of the war years was the presence of women, large numbers of whom served as controllers during the conflict. The nation's air traffic system coped with a great increase in flights during the war, and the number of centers jumped from 15 to 27.